Video clip synopsis – What does it feel like to be a soldier at war? Tense young Australian soldiers creep through the Vietnamese jungle, ever on the alert for the Viet Cong. Broadband MP4 vietnam_bb.mp4 (4.8MB), suitable for iPods and computer downloads. 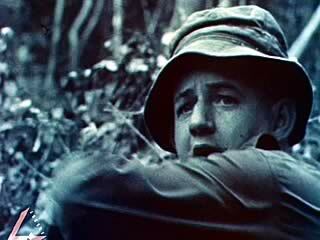 Australian Soldiers On Patrol in Vietnam is an excerpt from the film Action in Vietnam (27 mins), produced in 1966. In making this film about the Vietnam War, the Australian Commonwealth Film Unit did not look for battles and heroes. This was to be the story of the young Australians who were carrying on the standards of service begun by their grandfathers during the First World War. The emphasis was on people, both Australian and Vietnamese. The intention was to show what war really feels like. Action in Vietnam was produced by the Commonwealth Film Unit for the Department of the Army. Vietnam War and the social, political and cultural changes that resulted from it. 5.7 explains different contexts, perspectives and interpretations of the past. In 1965 Liberal Prime Minister Robert Menzies announced that Australia would provide combat troops to the war in South Vietnam. Australia had already sent military advisers to help train South Vietnamese forces, but now there would be over 1,000 *conscript and regular army soldiers sent there as a fighting force. These troops initially served in an American-controlled sector north of the capital, Saigon, but in 1966 Australia increased its military forces and assumed control of its own area, in Phuoc Tuy province, east of Saigon. Their role included patrolling, ambushing, protection of local villages and some aerial support for Allied troops. Between 1965 and 1971 about 50,000 Australian servicemen and some nurses served in this conflict. While initially public opinion supported Australia’s involvement, by the end of the commitment in 1971 public opinion was far more divided. Particular tension within society centred on the issue of conscription by ballot, where 20-year-old men were selected randomly to serve two years in the Army, with the possibility of being sent to Vietnam as combat or support troops. To conscript: to call up, enlist recruits for compulsory military service. Look at the clip, consider the images shown and record what you believe the film maker was wanting to convey. Because of widespread TV coverage of the Vietnam war many Australians saw images of what Australian ‘Diggers’ were experiencing in Vietnam. To what extent may this have influenced anti-war sentiments in Australia? What other reasons were there for Australians opposing the sending of Australian troops to Vietnam? In the clip some of the soldiers look quite young. How young were the youngest troops sent to Vietnam and what percentage of those that were sent were conscripts compared to the percentage who were volunteers? Conscription in Australia during the Vietnam War was a controversial and divisive issue. Interview a range of people about their attitude to involvement in the war, and to conscription. Prepare a report on your findings. The Vietnam War had a harmful effect on many soldiers. Research on the internet the impact of the war on Australian Vietnam veterans and families. Robert Lewis, Voices of Vietnam: Investigating Images & Experiences of Australia’s Involvement in the Vietnam War, HTAV, Australia, 1996.